Too much sadness lately. Just so many beautiful furry souls have left us for the Rainbow Bridge. We didn't know them all, but we were sorry to hear of their passing and our thoughts are with their families and friends. One of our blogging pals is Fiona from one of our favourite cat blogs The Cat on my Head. We simply cannot believe she has passed on. We'll miss her so much and we're thinking of her lovely family at this terribly difficult time. It is so sad to read about Fiona. She looks so pretty in that picture. I hope her family will feel better soon. Thanks for liking my page. She's very pretty. We shall miss her. The news about Fiona is so sad. 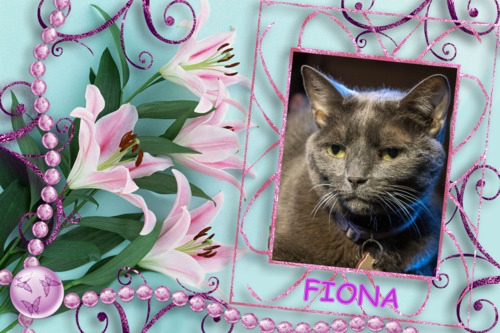 We were sad to see that Fiona went to The Bridge, this past week has been awful. What a lovely tribute to an amazing kitty! Thinking of you all at this sad time. Angel Fiona will always be watching over you.